Taro patch on Falalop, showing different kinds of taro, as well as bananas and coconuts growing around the edge of the taro patch. “Since garden plot are very small here,” Mariana Chim begins, “it’s the taro patch area that’s considered the main garden of the islands. We have small, individual patches. A bigger patch could be owned by a clan, and then is divided up among women of the clan. If somebody’s married into this clan, she would be given one of these smaller pieces, and her family in turn has to give another small piece in exchange for this one." 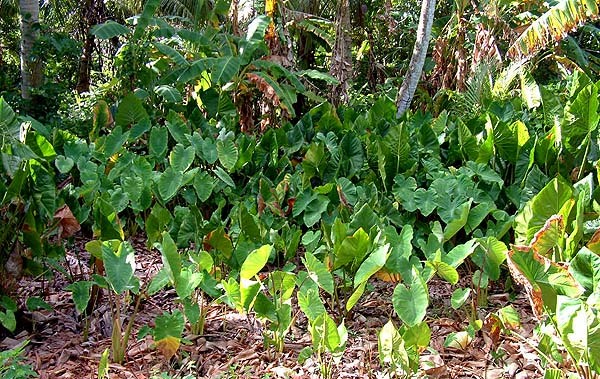 “There are names of these taro patches. Not the small, individual pieces, but that general area. The big patch has a name, having to do with the location in reference to the island. “We have eight varieties of taro. In the old days, those men considered to be capable of doing magic and such, they’re the ones who brought these special varieties of taro, each special variety of taro, to these islands. And they were brought out of Yap." 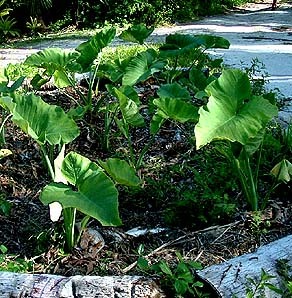 This small taro patch (towa) is very neatly defined. It sits confined between raised bunds,and is itself raised with channels for water all around. This pool, near the taro patch on Mogmog, is where the women wash the taro after harvesting. "Why them? Because they believed they could protect that plant from just dying on the way, before it reached here. And once the taro plant is placed in a particular plot or taro pit, young ladies don’t go there. Only older people tend to that plant until it produces, and then they spread it out. “Agriculture is mainly women’s responsibility. If there’s an old man in the family who cannot go fishing anymore, he may help with the garden. 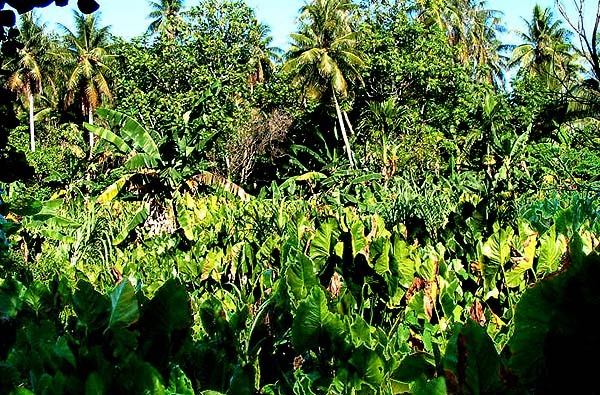 The whole taro patch area is called bool or ibol. This one is on Mogmog. "A long time ago," Lourdes continues, "if someone passed away, there were some women who could not go to taro patch. They call them mwuwaaw. They’re in a clan or something. They cannot go to the taro patch for three months. They would tell someone to go and take some food from their taro patch. But those people could not go there." “When we go to taro patch, we take some leaves, green leaves and dry leaves, and we put them on the taro patch. We put the leaves on the mud in the taro patch. We say that maybe the taro can ‘eat’ those. We put dry leaves and green leaves, and put coconut frond on the top. “If your taro patch is better, no grass, then you just go to your taro patch one week, two week, three week. Not very often. 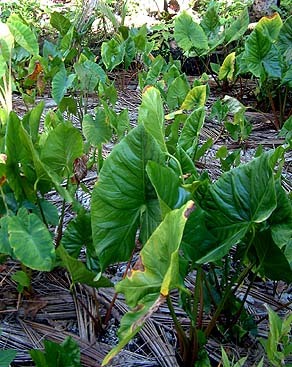 But if your taro patch has no taro on it, then it’s grows grass, and trees start growing up. Then you can work on it. 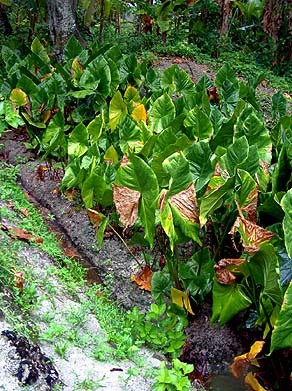 A taro patch is small, not really big, but one person takes care of one, two, or three." "To cook it," Mariana says, "peel off the skin, cut it up, put in the pot, add water and we boil it. For big projects, community projects, like the construction of Men’s House or Women’s House, that’s when we use the underground oven, because there will be so much taro to be cooked at one time. So it’s going to be a big pit. For regular consumption, we will just cook it in a pot." A carefully laid thatch of dry coconut fronds on a taro patch. 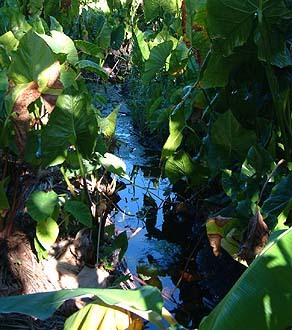 Water channel (yaad) between two taro patches in the Mogmog taro patch area. “There are channels in between the taro patches," Lourdes explains. "Now, the water is always up. But not before. Sometimes when you go there, only mud you can see between the taro patches. "But now the water is coming up between the taro patches. If there’s heavy rain, the water comes all way up on the taro, and covers it over. That’s not good. When the water covers the taro patch, after a few days some of them die. If you have sweet potato on your taro patch, when the water covers the taro patch, the sweet potato dies." “We don’t have any taro patches on Fedraey,” Albert points out. “We just have wild taro. But then the Department of Agriculture came in and told us that we have to make a solid concrete box and we have to put some leaves, dead leaves, inside and then they gave us some taro to plant in it. So right now, we have taro, and in maybe about six or seven months, we will come and harvest it. But before, we didn’t have any swamp taro at all." “There are three of these concrete taro patches: two are for the community and one they gave to the school. The one closest to the school, they gave this to the woman to teach the girls about how to go to the taro patch, how to take care of the small garden. But before we don’t have any taro patch. Only potatoes, bananas, papayas—that’s what we had. “Here, the water is our problem. We have a brackish water. We don’t have enough fresh water, like Mogmog and Asor. When you look at water catchment, that’s the reason why we requested the water catchments through the government, because we cannot drink the water from the well. We can take a shower with it, but we cannot drink it—it’s mixed with salt water." 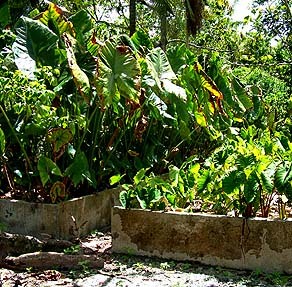 Two raised, concrete taro patches (towa smeen) on Fedraey. Taro is normally grown where there is natural swamp. 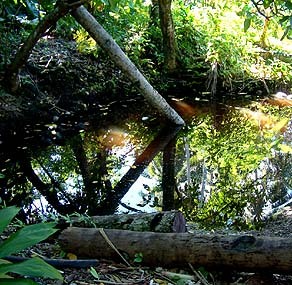 On a narrow island like Fedraey, there is no swampy area, and the freshwater lens is so small that the groundwater is brackish. Dryland taro (yood) growing at the intersection of three roads, on Falalop. “The other main crops besides the taro include the dry land taro or ‘wild taro’ as it’s sometimes called," Mariana explains. "And the reason it is also a main type of a food here is that it grows almost everywhere—even in the dry parts of the island, it grows. "And if somebody wants to grow this type of taro somewhere, she may ask permission from another land owner to use that part of land to grow that type of taro. And when the wild taro will not grow that good there anymore, that place is abandoned for certain time. They will choose or find another place. “Swamp taro is considered higher in terms of prestige. Dry land taro, you harvest until it is overgrown with weeds, and then we just leave it and do another plot. But swamp taro, we don’t leave it. No. We maintain it." “Planting a coconut tree is a man’s job. Each man plants a coconut for only his part of land. Each man takes care of his coconut trees, cleans them, and the trees that bear good coconuts, they take a type of a pandanus leaf—a wider type—and they wrap that around the stem of the tree to protect from rats going onto the tree and getting at the coconuts. Nowadays, we use tins instead of those leafs." “Some coconuts which are particularly tasty,” Mariano elaborates, “they know, so they pick these type of coconut, because those fruits will come in big bunches. These are the kinds that the land owner will protect from the rats. Because once the rats get up there, the coconuts will be falling down in a couple days, even before they’re mature enough." 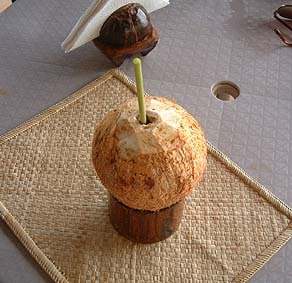 Different kinds of coconuts are used for different things. This one is for drinking, another kind for copra. Here, the straw is the hollow stem of a papaya leaf, and is called maengooer or mongoor. Note also the napikin holder. Roselyn Laimoh, at home in Asor, grating copra using a grater-stool (wadngeg). “Copra is produced for sale. It is picked up by the Field Trip Ship. The highest it earns is twenty cents a pound. Usually it’s like four cents a pound. Now these people are becoming money-oriented so they’re thinking four cents a pound is too low. But before, even three cents a pound, people made copra. That was the only way to make their money. "Coconut oil we use for massage, simply to tender the skin. Even sort of a like a sunscreen, lotion. And that’s from the copra. You husk the copra. Open it up and then you grind it. And you squeeze the milk out of that. And you boil the milk. Boil the milk until, it’ll boil for a couple hours until it becomes clear. Then that’s your oil." "If you’re making oil maybe for a lamp, then you just collect that oil like that, and you store it in containers. If you are making it perhaps to use on the body, for the skin, then you take the tops off of certain trees, to add fragrance, and you drop it in there." 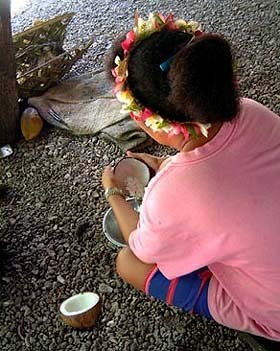 Tuba, the fermented sap of the coconut tree, is another important food product. Serphin says, "If you want to learn more about your family in the past, then you get your tuba and go to the old, older people in your family. And you drink and you ask them, and they will tell you— they said this, and this, and this, and that." Click here to learn about the making of tuba. Mariana Chim tends to some sweet potatos. A variety of bananas (yiiuch or wuuch) for sale at the YCA store in Yap include these enormous ones. 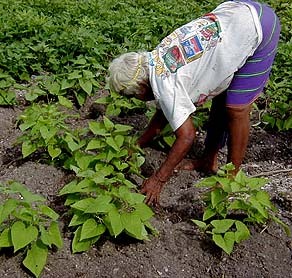 “Before, sweet potato gardens were in the village," Mariana says. "Not out of the village, because coconut trees were very precious. No one wants to cut down trees in order to plant sweet potatoes, so sweet potatoes were planted in the open spaces in within the village. But nowadays, people are cutting down coconut trees so they have open space for sweet potato." 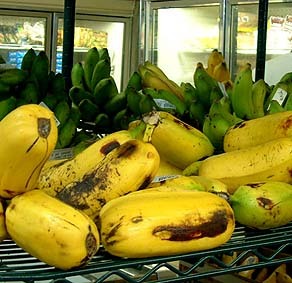 “The varieties of banana that we have now were introduced to this island. Before, the only type of banana that we had on these islands are the ones that the fiber is used for making the lavalava. It’s a very, very small fruit. That old variety still exists, usually alongside the swamp area, the taro patch areas." "Some houses have pigs—it is work for both men and women. Some people raise pigs for occasions like maybe the returning of a son from abroad, or the one that’s going to go to school. And some are raising for the market. Now people tether their pigs. "Before, the pigs just roamed around the island. If it came to a place and stayed there for a couple of days, you could claim that. So the pig was not that important. Some people don’t eat pork. To cook pig in the old days, it’s usually in the underground oven. Now these people are doing all kinds of cooking." 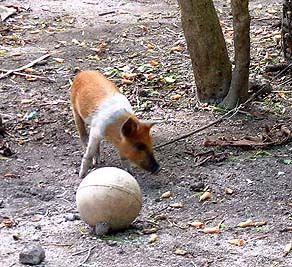 Tethered pigs (paabiy) are a common sight in Ulithi. Legendary aspects of the land are considered in the next chapter, Footprints.